Lung cancers usually aren’t discovered until they’ve spread and caused symptoms, and by then it’s often too late for a cure. Cancers that are detected before they’ve spread are often discovered by accident. That’s what happened to Julie Filer. Julie visited a walk-in clinic in Everett, Wash., last September for an unrelated issue and had a chest X-ray. While reviewing the image, the attending physician noticed a spot, nearly three-quarters of an inch in diameter, in the lower lobe of Julie’s left lung. She pulled an older, 2009 X-ray from Julie’s file for comparison, and there it was – smaller back then, but in the same place. The nodule had been growing in Julie’s lung, slowly and silently, for at least seven years. Several scans and a biopsy later, Julie had a name for the nodule: neuroendocrine carcinoid, a malignant, slow-growing form of cancer that’s unrelated to smoking. This cancer more commonly occurs in other parts of the body, such as the GI tract. Only 1 to 2 percent of all cancers in the lung are carcinoids. In addition to all of the unknowns surrounding the surgery itself, Julie, a first-grade teacher in Snohomish, was concerned about how long she would have to be away from her students. Dr. Alberton explained that he could offer her a new type of surgery that would minimize her recovery time and help her return to the classroom as soon as possible. He had just recently joined Providence to help launch a new robotic thoracic surgery program at Providence Regional Medical Center Everett, a tertiary care center located 20 miles north of Seattle. The hospital has used the da Vinci Xi robotic surgery system for gynecology, urology and general surgery for some time; thoracic surgery is one of the newest applications for the technology. Traditional open lobectomy requires a large incision and spreading the ribs to reach the lung. While about 70 percent of thoracic surgeons in the US still do open surgery, says Dr. Alberton, the traditional approach is falling out of favor where minimally invasive techniques are an option. Video-assisted thoracic surgery, or VATS, involves operating through smaller incisions between the ribs, using an internal camera to view the surgical area. The less-invasive technique makes recovery easier and faster. Robotic surgery, the newest advancement, combines the advantages of small incisions with robotic precision, enhanced vision and improved dexterity. Early studies suggest that robotic surgery may result in less pain and a faster return to normal activities than either open surgery or VATS. Currently, less than 5 percent of thoracic surgeries in the US are done robotically, says Dr. Alberton, but that’s growing as more surgeons become trained and the advantages become clear. Based on his experience with all three approaches, including more than 100 robotic cases during his training, Dr. Alberton believes that robotic surgery is the best option for patients. The console displays the surgical field in three dimensions with up to 10 times the magnification, compared with the 2-D display of VATS. On Dec. 3, 2015, Julie became the first person to have a robotic lobectomy at Providence Regional Medical Center Everett. During the 2½-hour procedure, Dr. Alberton sat at the console, his thumbs and middle fingers strapped into finger loops that conveyed his movements to the robotic surgical instruments. Thoracic surgeon Kimberly Costas, M.D. assisted at Julie’s bedside. Everything went perfectly. Just two days after having the lower lobe of her lung and her lymph nodes removed, Julie went home. Within a week, she felt good enough to stop using pain medication; “I didn’t even take Tylenol after that,” she says. After another week, she was back to her normal activities, and by Christmas she was walking around her neighborhood again. Julie returned to teaching on Jan. 14, cancer-free, with no need for chemotherapy or radiation therapy. “We both feel that it’s a significant advancement in thoracic surgery,” says Dr. Costas. Providence offers da Vinci robotic surgery in Washington, Alaska, Oregon, Montana and California, with a growing number of hospitals specifically offering it for thoracic surgery. 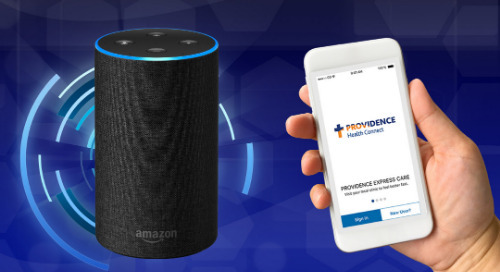 Ask your provider for more information, or find a Providence doctor in your area.